The Siamese Cubes, devised by Tony Fischer, consist of two cubes joined together along one edge so that they share three pieces amongst them. These shared pieces cannot move, and the pieces of the joined cubes cannot intermingle. The two halves can therefore be solved separately. Each of the two cubes in a Siamese Cubes puzzle can be considered to be a bandaged cube, which is made from a standard Rubik's Cube by gluing the three pieces along one edge of the cube together, i.e. there is now one large 1x1x3 moving piece on the cube. If you can solve such a bandaged cube, then you can solve the Siamese cubes separately in the same way. There is only one bandaged piece on the cube, so by keeping that piece fixed and moving the remainder (including the centres) the puzzle forms a group generated by face and slice turns. This puzzle was first produced in 1983 by Ideal under the name Rubik's Mate. Mèffert produces and sells this puzzle, the Pyraminx, Megaminx, Skewb, and many others. Ton Dennenbroek shows how you can make one of these yourself. It is one of the easiest custom mods. The same notation is used as for the Rubik's cube. The letters U, D, L, R, F, B are used to denote the faces of the cube. The cube is held so that the bandaged piece lies along the bottom left edge, between the D and L faces. Only the R and U face can be turned. These letters also denote a clockwise quarter turn of that face. A letter followed by a 2 or an apostrophe denote a half turn and an anti-clockwise quarter turn respectively. A combination of letters can be used to denote a particular piece position on the cube, e.g. URF means the corner contained in the three adjacent faces U, R, and F. The middle slices will be denoted using lower case letters, r and u. Note that a slice turn does not move any corner pieces. The last point is because the corners are moved only by turns of two adjacent faces. The two generator group on the cube is well known, and its action on the corners is as the PGL(2,5) group, of order 5!. For a good explanation, see David Singmaster's "Notes on Rubik's 'Magic Cube'", or my own page on the Two-generator corners group. This leaves 12!·5!·210·35 = 14,302,911,135,744,000 positions. Note that the puzzle becomes somewhat more difficult if the bandaged piece has no colours. It is then more difficult to find out where the pieces belong. Also, if the bandaged piece is upside down (or rather the other pieces are placed upside down w.r.t. the bandaged piece) then the puzzle cannot be solved because the number of flipped edges is odd, and the permutation of pieces is odd. Find the corner that belongs at DFR. Turn R or U to bring it to the URF position. 1. To move URF->DFR, do U'R2. 2. 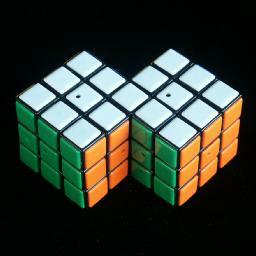 To move RFU->DFR, do U'R'U'R2. 3. To move FUR->DFR, do RUR'. Find the corner that belongs at DRB. If it lies incorrectly positioned at DRB then do R'U'RU2, otherwise turn U to bring it to the URF position. 1. To move URF->DRB, do U'R'URU2R'U'R. 3. To move FUR->DRB, do U'R'U'R. Phase 2: Place the U corners correctly. Count how many of the U corners are correctly oriented w.r.t. to U face. If all 4 are twisted then put a corner needing a clockwise twist at the ULF position. If three are twisted then put the correctly twisted corner at the ULF position. If only two are twisted then put a corner needing an anti-clockwise twist at the ULF position. Repeat b and c until all corners are oriented properly. Turn U to put the corners in place. Phase 3: Place the edges in their correct slices. There are three sets of edges, those in the r slice, those in the u slice, and the three edges in the other (immovable) slice. This phase places the pieces in their own slice, though not correctly oriented or positioned. It may move pieces that are correctly positioned already, but will keep them in their slice. The centres are ignored. Find a piece in the r slice that does not belong, and turn r to place it at the BD position. Find a second piece that belongs in the r slice but is not in that slice. If the second piece is in the u slice, then turn u to bring it to the FR position, and do RUr'U'R'. If the second piece is at UR then do Ur'U'. If the second piece is at DR then do R2Ur'U'R2. If the second piece is at UL then do U'r'U'rU2r'. Repeat a-f until the r slice has all its edges. Turn the puzzle over, so that the D and L faces are swapped, and repeat steps a-g until the new r slice is also correct. Phase 4: Place the centres correct. If the U/D centres need to be swapped then do r2. If the U/D centres are not correct then turn u to bring the U centre to the front, and do r.
Do u to place the remaining centres correct. Phase 5: Place the r edges in position. To swap two adjacent edges in the r slice, turn r to bring them to the U face, do U2, and turn r to bring the centres back in position. Repeat step a as often as necessary until the slice is correct (ignoring the U corners). If the U corners need to be moved back into position, do R2U2R2U2R2. Phase 6: Place the u edges in position. To swap two adjacent edges in the u slice, turn u to bring them to the R face, do R2, and turn u to bring the centres back in position. Repeat step a as often as necessary until the slice is correct (ignoring the R corners). If the R corners need to be moved back into position, then do the sequence U R2U2R2U2R2 U R2. Phase 7: Place the remaining edges in position. If the remaining three edges are incorrectly positioned then there are only two possibilities. 1. To move UL->UR->DR, do RUR2 U'R'U'R' U2RU. 2. To move DR->UR->UL, do U'R'U2 RURU R2U'R'. Phase 8: Orient the edges. All the sequences used below are conjugates of rUrUrUrU (which flips the pieces UL, FD, BU, BD) or combinations thereof. If you are proficient at cubing, you can probably solve this stage a lot quicker by using your own conjugates. Note that the edges are not solved individually, so a step may flip edges that are then solved in later steps. Consider the edges in the F/B slice (i.e. UL, UR, DR), and see which ones need to be flipped. 1. To flip all three edges, do UR2r2 U'rU'rU'rU' r'R2U'. 2. To flip UR, UL then do Ur2 UrUrUrU r'U'. 3. To flip DR, UL then do R2Ur2 UrUrUrU r'U'R2. 4. To flip only UL, then do rUrUrUrU. 5. To flip only UR, then do rU'rU'rU'rU'. In all other cases, you need to turn over the puzzle so that the D and L faces are swapped and then you find yourself in one of the cases handled above. Count how many of the edges in the r and u slices still need to be flipped. If there are more flipped edges in the u slice then turn over the puzzle, so that the D and L faces are swapped. If all 8 edges need to be flipped then do the sequence R rU'rU'rU'rU' R. Now only 4 edges need to be flipped, which is explained below. If 4 edges in the r slice and 2 in the u slice need to be flipped, then turn u to bring an unflipped edge to FR and do R rU'rU'rU'rU' R'. Turn the u slice back into position. Now 4 edges need to be flipped, which is explained below. If only the 4 edges of the r slice need to be flipped then do the sequence U'rUr' UrUrUrU r2U'r'U. If 3 edges in each slice need to be flipped, then turn r and u to bring the unflipped edges at FU and FR and do R rU'rU'rU'rU' R'. Turn the u and the r slices back into position. Now 4 edges need to be flipped, which is explained below. If 3 edges in the r slice and one edge in the u slice need to be flipped, then turn r to bring the unflipped edge at FU, and u to bring the flipped edge to FR, and then do R rU'rU'rU'rU' R'. Turn the u and the r slices back into position. If 2 edges in each slice need to be flipped then turn r and u to bring unflipped edges to the FU and FR positions, and then do R rU'rU'rU'rU' R'. Turn the u and the r slices back into position. Now there are still 4 flipped edges, but there are three in one slice, and this case is explained above. If only two edges in the r slice need to be flipped, then turn r to bring a flipped edge to FU and do R rU'rU'rU'rU' R'. Turn the r slices back into position. Now 4 edges need to be flipped, which is explained above. If one edge in each slice need to be flipped, then turn r and u to bring the flipped edges at FU and FR and do R rU'rU'rU'rU' R'. Turn the u and the r slices back into position. Now 4 edges need to be flipped, which is explained above.